Natural Grass Pesticide Concerns: How NewGrass Helps! Seems like public agencies, homeowner associations and local and state governments from coastal Maine to Alaska are restricting the use of lawn chemicals. in short, it’s an effort to protect drinking water supplies like streams and rivers. Yet, it’s an issue NewGrass removes completely, because natural grass pesticide concerns do not exist . “It’s just common sense. So if you’re concerned about protecting your groundwater you’ll eliminate natural grass pesticides and fertilizers,” said our NewGrass president. “Honestly, we give you the opportunity to get rid of those chemicals and still have a green lawn to enjoy year-round.” Also, NewGrass looks very real, so no compromise of quality. So several coastal towns in Maine have adopted restrictions on lawn chemicals. In addition, other restrictions have been enacted by New York State Parks, Chicago City Parks, 29 communities and townships in New Jersey, at least 17 cities in the Northwest covering more than 50 parks and communities throughout Massachusetts, Maine and Connecticut, according to various news reports and consumer awareness Web sites. • Anchorage canceled plans to spray the herbicides 2, 4-D and dicamba on the Town Square Park, citing concerns over the safety of children playing in the park. • The New York Department of Environmental Conservation initiated the “Be Green Organic Yard NY,” a program in which participating businesses agree to avoid synthetic pesticides. • The City of Redmond, Washington urges residents to use organic fertilizers. “Overuse of natural grass pesticides and fertilizers can damage beneficial soil life. Furthermore, it can wash off into streams and lakes. Consequently, it can harm plants or animals,” the Redmond report says. 27 are sensitizers and/or irritants. “The most popular and widely used lawn chemical is 2,4-D. And while it kills broad leaf weeds like dandelions,it is also an endocrine disruptor. As such it is dangerous for humans. Indicators associate it with with thyroid problems, prostate cancer and reproductive abnormalities. In addition, other lawn chemicals like glyphosate (RoundUp) link to serious adverse chronic effects in humans. 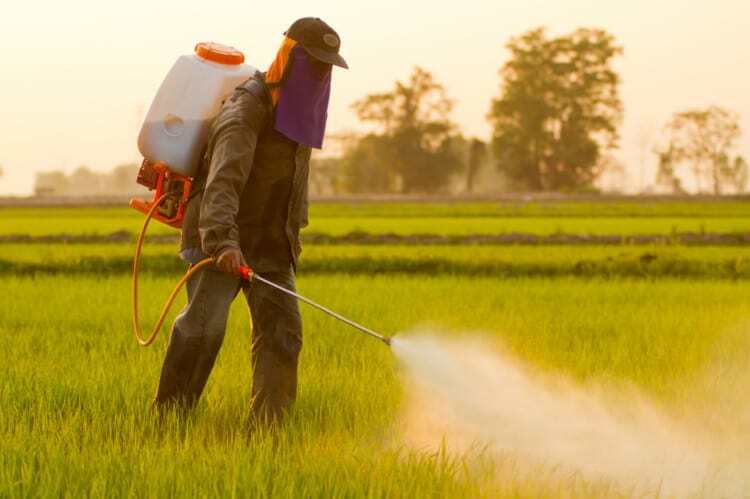 Furthermore, Imidacloprid, may be responsible for recent Colony Collapse Disorder (CCD) phenomena, according to Beyond Pesticides. Yet, with NewGrass, you get a lush, green lawn year round. Synthetic grass is NewGrass. SO contact us to eliminate pesticides and green up your next commercial project! There are so many artificial grass uses, you might just be surprised. So toss out your natural grass pesticide and switch to NewGrass!